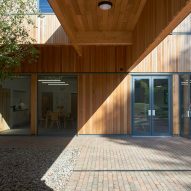 The London-based practice designed the buildings for St Teresa's School, an independent girls' school in the village of Effingham, in an area of Outstanding Natural Beauty. 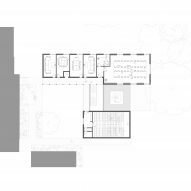 Its courtyard is a nod to the arrangement of old university colleges around cloisters, and a means of drawing the natural landscape further into the scheme. 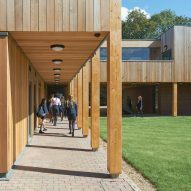 This design decision was driven by research into the benefits of natural views on pupils' mental health and concentration. "Nature pervades the entire scheme," said IF_DO. 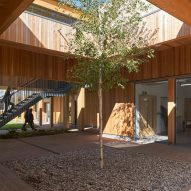 From the formal courtyards to the outdoor woodland classroom, to the tree growing through the "roof canopy at the centre of the plan." The sixth form centre comprises two blocks, one housing classrooms, offices and a common room, and the other a lecture theatre. Connected by a covered walkway, these buildings wrap around two sides of a large courtyard to form a colonnade. "The scheme includes a sequence of elements which harnesses the under-utilised green spaces of the school's site," said the architects. Classrooms look inward to the central quad, and common areas and the lecture theatre look outwards, over the woodland canopy. A new silver birch tree stands between the two buildings, overlooked by the common and reading rooms. The scheme uses prefabricated structural insulated panels (SIPs), a light steel frame and glued laminated timber beams for larger spans. 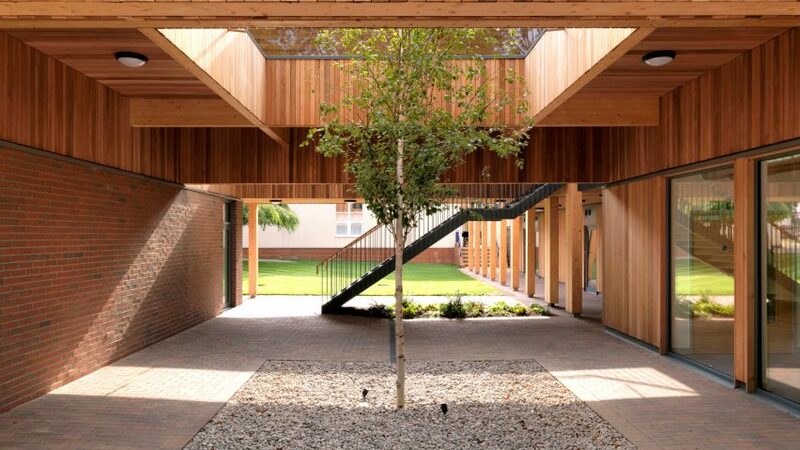 The whole building is clad in light timber, which contrasts with the brick ground floor of the lecture theatre block. IF_DO worked with contractor Net Zero Buildings, which specialises in low-energy, prefabricated classroom blocks. Solar panels will provide enough energy for heating and lighting the building. The sixth form centre is the first phase of a 10-year masterplan designed by IF_DO for the school, which seeks to both improve its existing buildings and their connection to the surrounding landscape. IF_DO garnered much attention in 2017 for their mirrored pavilion at the Dulwich Picture Gallery for the London Festival of Architecture. 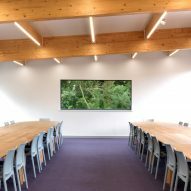 Studio Weave has also designed a school that connects to its woodland surrounds with sliding doors that can open classrooms up to the outdoors. Photography is by Charles Hosea unless stated.